sherry26 wrote: Wakita is Tsutomu obviously. To those who think Kuroda is Tsutomu... How are you going to explain 'demon in the darkness' quote? Probably the same way you'd explain the quote if it applies to Wakita...? Not really seeing the issue here. Okay here's what I believe. Mary quotes Tsutomu a lot. In the end of that Hotta Gaito murder case, Gin and Mary use the same quote. So I agree Gin and Mary using the same quote implies that Tsutomu infiltrated the organization at some point. We don't necessarily have to assume that Tsutomu's still in there. Haibara indeed met Kuroda and didn't get triggered on her first encounter, just like she met Rumi and didn't get triggered on her first encounter. It's only when both Kuroda and Rumi are at the same case together that Haibara gets triggered, and while it very well seems like Rumi's the cause of it, Gosho has used her BO radar thing to fool us in the past so I don't think it's out of the realm of possibilities that Kuroda could actually be the cause. (and as an extra, I'd say that Haibara not meeting Wakita yet is more of an additional hint Wakita is Rum rather than Tsutomu). It's just that we have a big reason to think Kuroda's been involved with the Kouji case, and the only three people (potentially alive) we've heard of who were involved with it to some degree are Rum, Asaka and Tsutomu, then Tsutomu's the one that fits Kuroda the most (at least in my opinion). Kuroda seems too oblivious to be the person who had infiltrated BO in the past. It's more likely that his source of Info regarding BO is his underling Bourbon. He's an out and out NPA guy. Now if we really think he was involved in Kohji case how much was his involvement? We only get a glimpse of Kuroda thinking about Kohji's corpse. Given our current Tsutomu speculation(that Tsutomu botched up one of Rum's eye and thus bought Kohji some time to complete the message) Kuroda is very unlikely to be Tsutomu. he's more likely to be the Bodyguard who was codenamed Asaka. 1)Wakita's name is a direct reference to Toki Wa Kanenari="Time is money." 2)Wakita has a seemingly non-working eye. 3)Wakita is so clingy that he becomes suspicious in the process. 4)Wakita tries to gather info from a family friend of Shinichi. 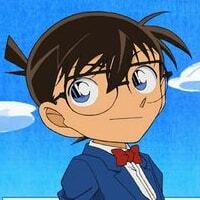 5)After seeing wakita Conan was reminded of Rum. So Wakita will remind anyone who knows these (Old, strong and Womanly one eyed stuff) about Rum. Wakita wants to accompany Kogoro but he comes off as a suspicious fanboy instead of a suave agent(Bourbon's ploy of becoming apprentice). Wakita asks about Shinichi from one of the family friend of Kudos in a very suspicious manner. Combine his love for the idiom and Gin's interest in Kogoro. He can be very well be a ratty Bo who wants to know how much Kogoro knows about Rum(instead of BO's mission of keeping watch on Kogoro) and alert Rum's target Shinichi Kudo. Would real Rum be this sort of a buffoon, but if he's Rum's enemy it makes sense. So he's either Asaka or Tsutomu, but he acts more like Tsutomu than Asaka. So I agree Gin and Mary using the same quote implies that Tsutomu infiltrated the organization at some point. We don't necessarily have to assume that Tsutomu's still in there. So if he still is not there then that means he infiltrated it at some point but was successfully able to come out of it without them knowing he is a traitor.But that's unlikely. Because we all know that what organisation does with the traitors.And even if he was able to come out successfully,the organisation would have known about him.I mean the senior members at least. Haibara indeed met Kuroda and didn't get triggered on her first encounter, just like she met Rumi and didn't get triggered on her first encounter. It's only when both Kuroda and Rumi are at the same case together that Haibara gets triggered, and while it very well seems like Rumi's the cause of it, Gosho has used her BO radar thing to fool us in the past so I don't think it's out of the realm of possibilities that Kuroda could actually be the cause. Haibara indeed got triggered in the burning tent case but it wasn't because they emit bo aura.Because of the way Rumi was staring at that one eyed dude.There's difference. Yeah it's true that her radar completely failed during that shrine case but I think we can still believe in her bo radar because it failed only once and rum is number 2 of the organisation. So you really think Wakita is rum? In Wakita's intro case he calls rum weak. How do you explain that? Is rum self critical? 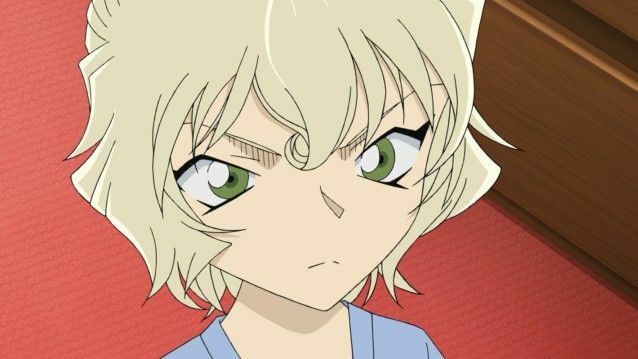 Also, If I were number 2 of the organisation,I wouldn't go myself disguising to check on my targets....I would give other members order exactly what the actual rum did.He ordered Amuro. Its true that we are currently aware of only 3 people being involved.But you can't deny the possibility of fourth person being involved.What if rum is not one of those 3 suspects and is actually a fourth person? And we still don't know exactly up to what extent Tsutomu was involved.He also might not be present there when the actual murder happened.And got involved in it as a case. sherry26 wrote: What if rum is not one of those 3 suspects and is actually a fourth person? 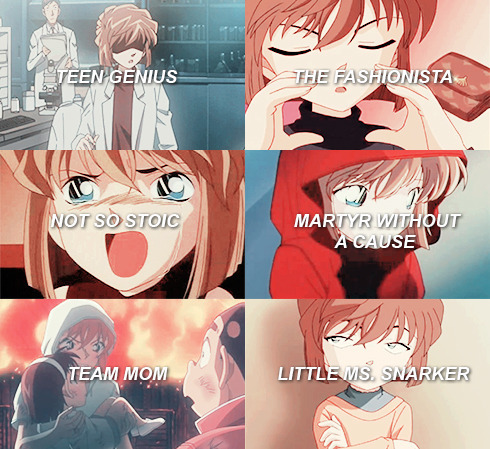 Would Gosho ever do that kind of thing, though? sherry26 wrote: So if he still is not there then that means he infiltrated it at some point but was successfully able to come out of it without them knowing he is a traitor.But that's unlikely. Because we all know that what organisation does with the traitors.And even if he was able to come out successfully,the organisation would have known about him.I mean the senior members at least. Maybe he was found out, though? While I don't know how much of Kuroda's given backstory is true, it's at least safe to say he was gravely injured in the past. Maybe the BO thought they had him but he survived (and as such had to go with a different identity. And as far as the BO and traitors go... Akai managed to survive pretty well all things considered. Btw, that guy she was staring at wasn't one eyed (not important, just wanted to point that out). So you really think Wakita is rum? Yes, the "time is money" thing sealed the deal for me for the most part. It's exactly the type of silliness Gosho would be willing to go for (as evident by the "Aono" hint from the latest case). I'm also not looking for other suspects besides the main 3, and under the process of elimination, Wakita fits the bill the most. In Wakita's intro case he calls rum weak. How do you explain that? Is rum self critical? Also, If I were number 2 of the organisation,I wouldn't go myself disguising to check on my targets....I would give other members order exactly what the actual rum did.He ordered Amuro. And if I were Shuukichi, I wouldn't start avoiding my girlfriend at the expense of getting seven titles in some game under the pretense that she'd be really into that, much less would I condition my marriage to her based on getting all of those seven titles because that's a really stupid thing to do. I guess that my point is that what we would be doing if we were the characters isn't that great of an argument, and characters in this series have exemplified time and time again that they can be dumber than a rock and their actions can be inherently silly. Especially the organization, which has showcased quite the incompetence considering all the spies it has in it. I don't look at it from the mindset that Rum is like this genius tactician who will be smarter than the rest of the bunch. 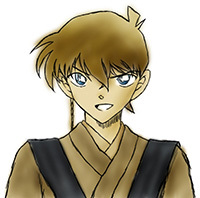 Since he's a character that's written by Gosho, he'll probably behave like a character that's written by Gosho. Its true that we are currently aware of only 3 people being involved.But you can't deny the possibility of fourth person being involved. The inability to deny a possibility doesn't inherently mean said possibility is more likely than others. There are plenty of possibilities I can't deny currently. I mean, you can't deny the possibility that Kuroda could be Tsutomu, right? What if rum is not one of those 3 suspects and is actually a fourth person? I've yet to see a super convincing theory that uses all the knowledge we have to pinpoint Rum as a 4th person, though. I also tend to believe that the idea of a 4th person stems from wishful thinking by readers who hope Gosho wouldn't be so repetitive or predictable (even though Gosho is extremely repetitive as a writer). I always leave room to the possibility I'm wrong, though. Yet still this Kuroda(Tsutomu in your opinion) is more interested in Wakasa Rumi than in Rum? That's a severe red flag for me. Kuroda was in Karasuma group, his wife knew of the name yet he interprets it as Wakasa Rumi. That's the biggest ever red flag. Yet the same woman has a BO kill list(APTX list), has a laptop which can open the said list(as BO documents can't get opened in anything which is not theirs), has something very intriguing in her name yet BO gives two hoots about her and in general is being just a bait to lure out people who is interested in Kohji case(i.e Kuroda). It means that Wakita is aware of the quote and using it to gauge Kogoro's cognizance of Rum. Recall, that after seeing Wakita, Conan thought of Rum. Best not to give it a thought, cause that's relating to Pirate's spirit the horse, no more or no less. Nothing to say here, yet maybe there's a little room for thought. Else Jodie would have been Vermi and The FBI agent would have been Araide. There's a very big hint that there could be more than 3 people involved. Ask yourself would Tsutomu or a bodyguard(Asaka) take away stuff from a corpse's hand to botch up the crime scene? Rum, Asaka, Tsutomu and Clue thief are the four players. Yup, that's where I have to agree. Zerozaki4869 wrote: Rum, Asaka, Tsutomu and Clue thief are the four players. Four unknown variables doesn't mean that they can't end up being three players. Personally however, I'm seeing at least 2 more people involved besides the three Rum suspects. Hence it's it's fairly logical to assume the fourth player, if evidence arises, the fourth player may well just merge in one of the three or get into it's own self. [x] Neither of them gonna be the current Rum. Wakita is the old Rum. Nobody is Old Rum or new Rum. Rum is one single person. Q17 Told us that BO agents who are dead on the line of work, don't keep their codenames possibly because in near future during Boss arc the same codenames will resurface. Last edited by Zerozaki4869 on December 18th, 2018, 10:26 pm, edited 1 time in total. Oh, well... time to bury the fourth suspect (especially Chikara and Muga) theories, it seems. 'Cause that answer seemed pretty definitive to me. You expected Rum to be one of those three from the get-go, right? So where does this rate on the Gosho Aoyama disappointment/let down scale? Or has it all kind of melded together, at this point?